I have full grocery bags sitting on the kitchen floor, an unmade bed staring me in the face, and three kittens scampering around my living room. Yet here I sit. Blogging. I love it. You know, when I told Emma she could bring a kitten in to the house, I was anticiapting that we'd be moving in to the new house THAT weekend. Now I find myself changing "glitter" boxes, picking bits of dry catfood off the bottoms of my feet when I step out of the shower and peeling the little claws of dangling kittens off my window screens. The kittens have taken over our bathroom and are slowly taking over the house. Their "house" is in the bathroom–the bathroom that is already a step-sideways-if-more-than-one-person-is-in-there kind of bathroom. The bathroom where the sink sits tenderly on brackets on the wall…brackets that are expecting a set of metal legs to help hold up some of the weight. Metal legs that are no longer there. And when you bump a little too hard into the sink you find you're holding it in your hands and scrambling to turn off the water before it leaks all over your bathroom floor. So adding three kittens, a litter box, a water and food bowl in that bathroom? It makes things a little tight and a little tricky. Sometimes the chaos I endure for my children is mind-boggling. And when did our one kitten become three? Well, when Mary had a fit of jealousy over Emma having Rosie and her having nothing. Which dredged up all kinds of memories of her "Springy", last year's kitten that got hit by a car and now lives with Jesus. The one that makes her announce out of the blue, "I want to get flattened like Springy so I can go to heaven and be with him and Jesus." oy. So, the orange kitten, "Orange Juicy", then "Juicy", now "Juice", came to live in our bathroom. And then that left Juice's brother all by himself in the big scary outdoors and "wouldn't he miss his brother and be lonely?" Tears. Tears. More tears. A weak mother. And now there are three…Rosie. Juice. And, Prancer. As I said before…the chaos I endure…. And what do these pictures have to do with kittens taking over the house? Nothing, really. Except that maybe you could say they are symbolic of some of the chaos that has been reigning in these parts lately. 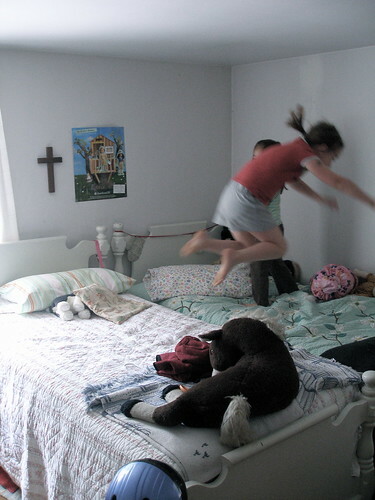 Bed-jumping is generally frowned upon in this house. As my mother said to me, and I now say to my own children, "this always ends in tears." But yesterday, Emma cleaned her room, made both beds and pushed them together, all of her own doing. I figured a good bed-jumping episode could be overlooked (and photographed). Some days we could all use a good jump on the bed. I want to jump on the bed! (tee hee) Sometimes we just have to stop and smell the roses . . . or stop and enjoy the chaos.This post makes me think of when my kids were little and the little rhyme:”Three little monkeys jumping on the bedOne fell off and bumped his head,Now there’s two little monkeys jumping onthe bed.”Anyway, Molly, enjoy your monkeys because it won’t be long before they’re gone.You’re a great mom!!! Keep on keepin’ on! Oh, a little bed jumping is good for the soul…teehee. “Ohhhh, I want to get flattened to go be in heaven with my poor kitty!” I can hear it now. Hilarious! bless you, Molly. I think I’d have lost it somewhere around side-stepping the kitten litter and holding up the sink. That so needs to be cross stitched on something. Oh those kitties are just precious. So are those bed jumpers! Molly, you are such a good mother. And although I’m sure your girls already think you are the best, they are really going to understand how blessed they are when they become mothers. Three kitties? Oh man, I couldn’t do it! But I’m sure hearing Mary say she would like to be flattened like Springy would kill me. 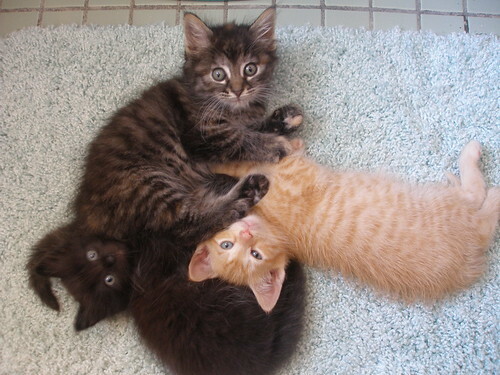 Oh three kittens, you have your hands full! So sweet that they pushed their beds together! Way to turn the other cheeck mom. Sometimes a good jumping session is just what the day needs! Here’s hoping that you have an injury free weekend! i had 3 grocery bags sitting on the living room floor when i read this post this afternoon. but i did put them away (chicken! milk!) before commenting. xoxo. hey, i thought juicy was mine! just kidding! glad all three kittens found a nice and happy home. sooner rather than later, they will be on those beds when people are jumping. There really isn’t anything better than the sound of kids jumping on the bed and laughing, is there? It make me want to be a kid again. Can I come jump on the beds too?? They’re little for too short a period, I realized today, and balance (sometimes letting them jump on the bed) is a good and necessary thing. I am conveniently allergic to cats. My 4 year old Samuel is obsessed with death and going to heaven right now. He asks me daily when are we going to die and go be with Jesus LOL We also lost a cat and he often asks if she is in heaven waiting for us. and Mary saying that she wants to get flattened like Springy so she can go live with him and Jesus has me LOLOLOLKids say the funniest things! I fell my feet itching to go jump on the bed. The only thing that’s keeping me is how to explain it to Vincent.One of the winery cats has had kittens weeks ago but we can’t find them. I have spent a lot of time searching and immitating cat noises, but apparently my accent is so horrible they don’t dare reply. The mother cat will probably bring them out when they’re grown tigers. Too bad. As the recent aquirer of 2 little kittens, I can see the problem. I wanted one, but took my son and then we were presented with 2 little girls to choose from. One black and one calico. I couldn’t choose, so we got both. Fortunately we didn’t even see their brother otherwise I’m sure we’d have him running around the house too. But having never had more than one cat at a time before, I’m loving the 2 cat thing. And our dog loves them too. A little choas is good for the soul. You should get on that bed and jump with them too! It would make you forget everything for at least a few minutes. The kitten are adorable.I posted a small little story of some things I went through when remodeling to help lighten your spirits.Have a great weekend. 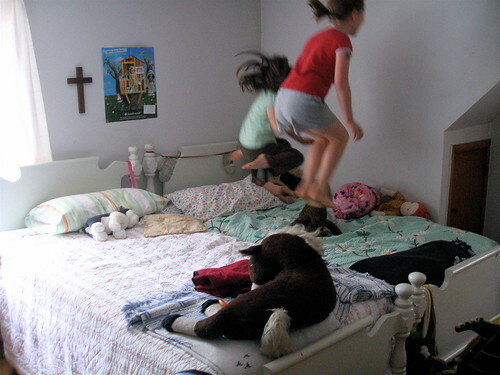 Three kittens and bed jumping…you are the greatest mother just ask my girls! Okay, I totally had a kitten at Mary’s age with the name “Orange Dress”. I really did.